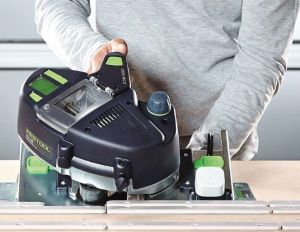 The new handheld Festool CONTURO Edge Bander is due out March 16th. If you’re a fan of Festool I’m sure that date is marked on your calendar and have already seen the instructional videos. Those of you reading that aren’t fans of Festool, after running the bander, I think you might be. I’m not a woodworker, or even really that handy – I fix most things in my house with duct tape… That said I have been trained and know how to use a bunch of the Festool products. As Festool comes out with new tools I don’t look at them like an 18 year old kid sleeping outside the Apple store waiting for the new iPhone. I look at does it do the job, does it save time and is it worth the investment. I have been playing with the CONTURO Edge Bander this week and I am convinced that it will save you time and money. You no longer need to do corner shelves, hutch verticals or countertops by hand. The CONTURO works on glue pucks which makes it very easy to change from white to natural colored glue. It works on banding up to 3mm thick X 2-1/2″ high and is ready to use in 10 minutes. I tried to rip the banding off after I edged the shelf, and due to the way the bander applies the glue, I snapped the banding every time. You will still have to trim the top and bottom edges but you will never have to wait for contact cement to set again. I can see the CONTURO as a nice addition to any shop that needs to band a radius. Are you a Festool fan? Which tools have saved the day? I would love to hear your experience in the comments below.